Even if we stopped adding CO2 today*, we'd have to prepare for more hot! the land surface warm is a lot more quickly than the ocean surface and will continue to do so until the new equilibrium higher temperatures are reached. To how much warming are we already committed? 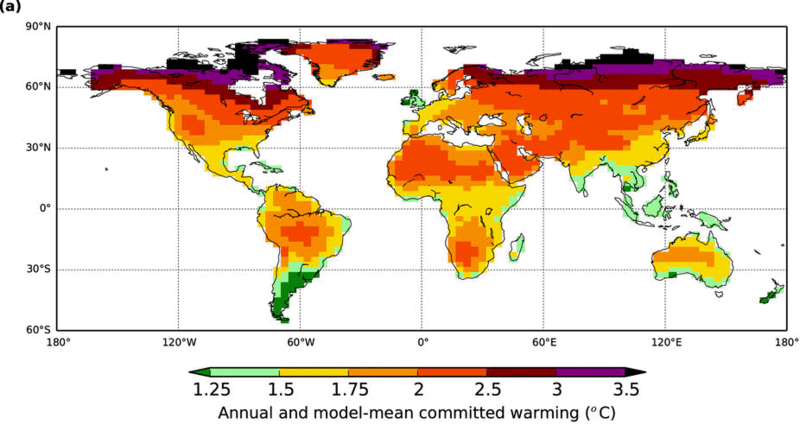 There is also a map showing the warming commitment in different land regions across the world. Some parts look a bit odd to me, such as coastal Australia. But who am I to argue?Other places are as you'd expect, like the high latitudes of the northern hemisphere. The authors explain in the paper why this matters (my emphasis and paras). Enhanced warming over land will affect terrestrial ecosystems, crop viability, glacier melt and cause other impacts, along with human health implications of higher temperatures including within cities. Increased and related leaf-level temperatures will raise vegetation respiration rates. The amount to which this will offset vegetation fertilisation due to higher CO2 concentrations will influence the global carbon cycle, and therefore also affect “permissible” emissions to constrain warming to any prescribed limit. 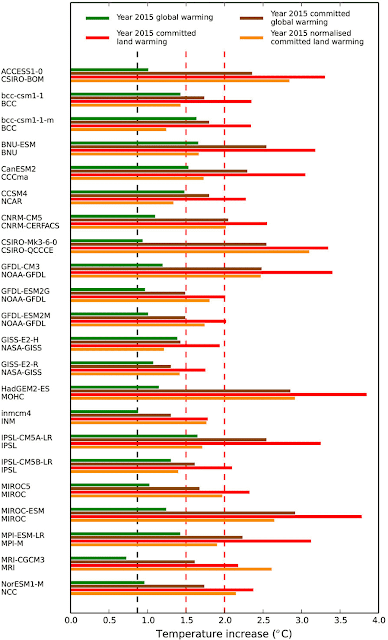 ...Demonstrated here is if heavy emissions reductions prevent either value being crossed, the robust inter-model estimates of land-sea warming contrast implies significantly higher temperatures will still be experienced over land. This must be taken in to account in any debate of 1.5 °C versus 2.0 °C as a global mean threshold aspiration. Marcus wonders why it's only over land. As the planet warms, the land surface warms more quickly for two reasons as far as I know. The oceans have a greater capacity for heat absorption so they retain a lot more heat in total without the temperature at the sea surface rising as much. The other thing is that with warming, more water evaporates from the oceans than from the land (where there isn't as much to evaporate) and evaporation has a cooling effect. …Curious,…why only over land ?? UHI ? Adrian Roman doesn't understand what is meant by equilibrium. When the amount of radiation leaving the Earth is the same as the amount of radiation coming in from the sun, then there is equilibrium. At the moment there isn't, because more energy is being kept on earth than is coming in from the sun. That's because of greenhouse gases are increasing so quickly. What equilibrium are they talking there? Are they highly delusional? It cannot be a thermodynamic equilibrium, for obvious reasons. It cannot be even a dynamical equilibrium, for some similar reasons but probably harder to understand by some. I would really like to see their definition of ‘equilibrium’, seems to be a highly equivocated one and possible undefined. Marcus has another question. He thinks he sees a contradiction, but it isn't. …Isn’t this a contradiction ? Poor Marcus is having a really hard time with this press release. He doesn't understand how something can still get hotter even while it's not getting hot as quickly. ,,My understanding is, that as “global ” land temperatures increase, the Oceans become less of a heat sink, so how could they be gaining heat as it gets hotter ? Time difference ? Dr. Deanster thinks he is on to something but I don't have a clue what's going on in his head. Maybe he is a greenhouse gas denier. Where do these guys come up with this stuff??? CO2 produces NO HEAT .. and therefore whatever eventual temperature that the atmosphere attains will be a function of incomming, stored, and outgoing energy. The only relevant storage capacity on earth resides in the ocean, and I don’t see any empiric data indicating that the ocean is going to heat the atmosphere by an additional 1.5C. This all goes back to the flawed way in which models handle incomming energy. TSI at the top of the atmosphere is not the same as SW reaching the surface, which accounts for over 99% of ocean heating. If SW reaching the surface decreases, the temp will drop, regardless of the increase in CO2. Mark - Helsinki wrote a lot of comments, here are just two of them. I am sick of climate science, the data sets show (for better or worse) 1.2 so these fn geniuses say 1.5, the same morons were saying much more a mere few years ago. Linear pseudo think, I am sick of it. FJ Shepherd does the usual denier thing of confusing diurnal variation with an overall rise in global average temperature. I just don’t know how my region is going to cope with another degree of Celsius warming. It really scares me. As it is, in my region, every year, from January to July, we rise from -10 degrees C to +27 degrees C. A rise of 37 degrees C every freaking year. That extra one degree C rise is going to kill us all in my region. Should I beg the UN to do something for us? Huntingford, C. and Mercado, L. M. "High chance that current atmospheric greenhouse concentrations commit to warmings greater than 1.5 °C over land." Sci. Rep. 6, 30294; doi: 10.1038/srep30294 (2016). There is a third reason why we would see more warming if we stopped emitting CO2: we would also stop emitting the vast majority of particulate and sulfur aerosols that are currently masking a portion of the increase in warming from increasing CO2. Furthermore, that warming bump would happen very fast and be long lived. Michael Mann certainly thinks that, he has written about it. So ironically fixing global warming might increase global warming for a while. Michael Mann certainly thinks that, he has written about it. The bit about nitrogen fertilization and increased photosynthesis due to sunlight diffusion is interesting, I did not know that. One of the best things about the election result has been the cabinet reshuffle, which has seen Greg Hunt no longer the minister for the environment. No minister for the environment could look at the data of global temperatures and think their work is done – especially if the majority of their work involved pushing the con of Direct Action onto the public. FJ Shepherd's vacuous comment on a rise of 1 degC can be turned around and applied to the Ice-Age-cometh meme: "As it is, in my region, every year, from July to January, we drop from +27 degrees C to -10 degrees C. A drop of 37 degrees C every freaking year." Why worry about a drop of 5 to 7 deg C in the global average temperature? Sou, is that stated correctly? Maybe someone has already made this point, but there are some subtleties to this. I think the paper is considering what would happen if we fixed atmospheric CO2 concentrations, not what would happen if we stopped emitting CO2. Fixing atmospheric concentrations would require continued emisssions. If we stopped emitting altogether, then we would probably not warm much more, although there might be some adjustments due to the different warming of the two hemispheres. There was an earlier comment about aerosol reduction causing warming even if we stopped emitting CO2. This is probably correct in the short term, but the CO2 forcing is about the same as the total anthropogenic forcing and it likely dominates the long-term warming potential. So, I think that if we stopped emitting altogether, there might be some initial warming due to the precipitation of the aerosols, and then a cooling back to something close to what we were at the time emissions stopped, as the non-CO2 GHGs decayed. Thanks, ATTP. I should have picked that up. It means the above (HW) headline is wrong, and the first paragraph might need to be tweaked. I'll see what I can do about that.